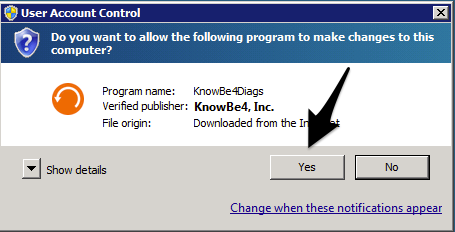 The KB4Diag tool is an executable file used by KnowBe4 Support techs to automatically gather issue-specific files (including event logs, security logs, and other applicable files) for troubleshooting purposes. It is common for techs to request you use this tool for issues regarding Active Directory Integration (ADI), Phish Alert Button (PAB), Weak Password Test, and RanSim. Once you download and run the diagnostic tool, relevant files will be gathered, packaged in a zip file, and automatically and securely sent to the ticket in progress, where your Support tech will be able to download and view the files. KB4Diag connects to https://knowbe4.zendesk.com/api/v2/ to validate your Ticket ID and Email Address. If you're using an outbound web filter, please ensure HTTPS connections (port 443) are allowed to that domain. Navigate to the file and run it. 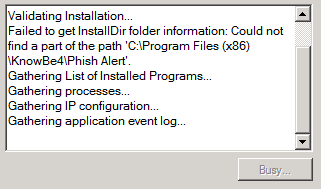 Click Yes when prompted to allow the program. 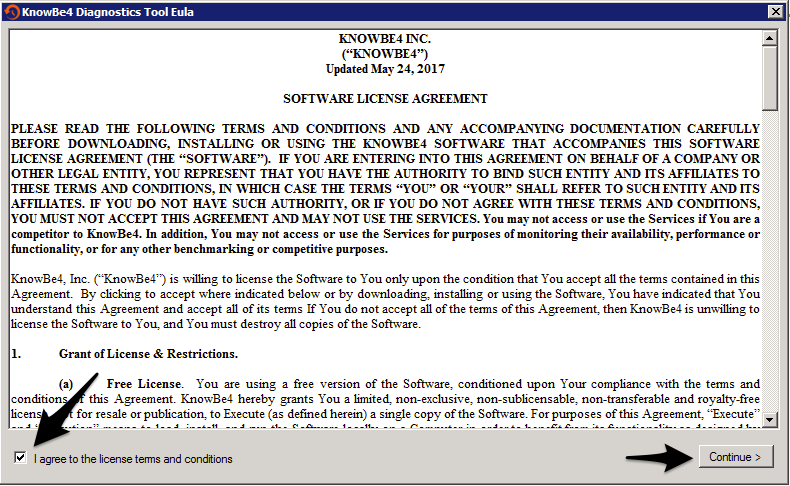 Check the box to agree to the EULA to proceed with running KB4Diag. Click Continue. *Note that the email address entered must match what you used when opening up the ticket for the tool to run successfully. *Note that with the second option, you must manually attach the zip file or selected files you'd like to send to the ticket. E: Click Run to scan for the relevant files based on the program you're having an issue with. The scan will take up to 10 minutes or longer depending on the number of files that need to be gathered. If you elected to send the data automatically, the Support tech will receive a notification once you complete the scan and will review the files provided. There are two errors that you may encounter when using KB4Diag and there are simple fixes for each. ERROR 1: Unhandled exception has occurred in your application. If you receive this error, the most likely cause is that you are attempting to run the file directly from Internet Explorer. Try saving the file to your Downloads folder instead. Once downloaded, run the file from within its saved location. If you're still experiencing issues with this method, let your Support tech know. ERROR 2: Email address not associated with this ticket. Please try again. If you receive this error, the most likely cause is that your email address is not correct. 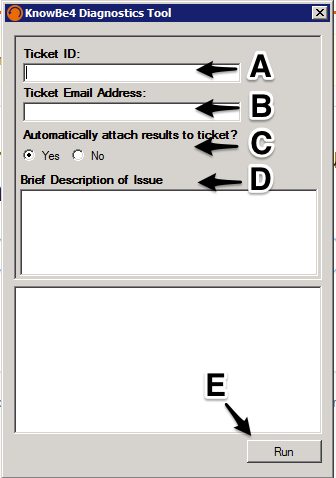 Double-check that the email you're typing in is the one that is on the ticket you have opened. Also, check out the formatting to ensure you're using standard email format. If you're still experiencing issues, let your Support tech know. I Don't Want to Use This Tool. What Should I Do? If you'd prefer not to use this program to gather the files, you are welcome to ask your Support tech for what specific files you need to gather and do it manually. The tool just makes it faster and more secure for you and the Support tech you're working with to transmit information.